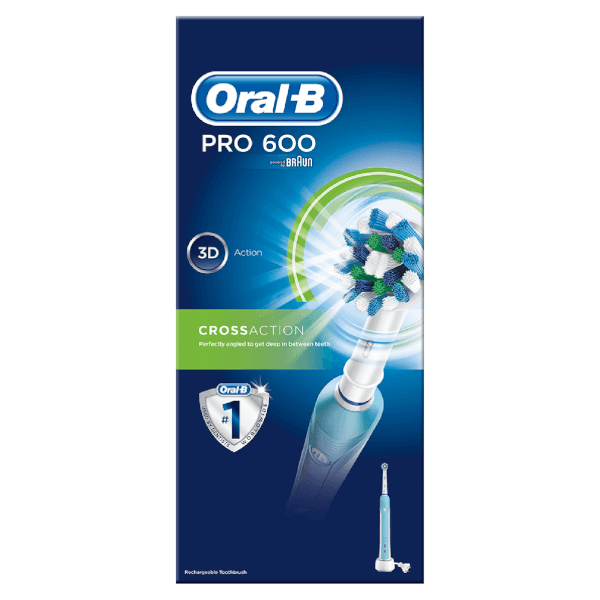 Transform your dental hygiene with the Oral-B Pro 600 Toothbrush; a rechargeable electric toothbrush with dynamic movement to effectively lift away more plaque than a regular toothbrush. Utilising CrossAction technology, the unique brush head features precisely angled bristles, with intense rotation, oscillation and pulsation around each tooth to break up and remove plaque build-up for a deeper, three dimensional clean. 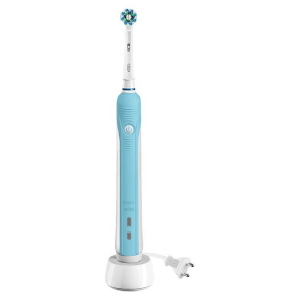 The daily clean mode ensures comprehensive results, with a helpful timer to indicate when you need to move to the next spot of your mouth and when you have completed the dentist-recommended 2 minute brushing time. Compatible with a range of brush heads for targeted care, the toothbrush is the perfect introduction to advanced oral health. Included in pack: Rechargeable Toothbrush Handle, Charging Station With Brush Head Storage, 1 Brush Head: CrossAction.